Ok, so I will be honest. I do not recycle. I use plastic water bottles. I let the water run too long in the shower. I do not use environmentally friendly products. I'm totally "green" at being Green. I do use an "organic" exterminator. That's only because my dad's girlfriend found the for me. I have started "thinking" about being more green. I even went as far as looking for places close to me to drop off recylced items once I start "recycling". I even considered trapsing 20 miles away just to recycle, but then I had to be honest with myself. I'd just end up with a bunch of recycle crap - and end up throwing it in the weekly trash. I watched the author of "Gorgeously Green" on Oprah. I can't remember her name. She was very informative and mentioned baby steps. 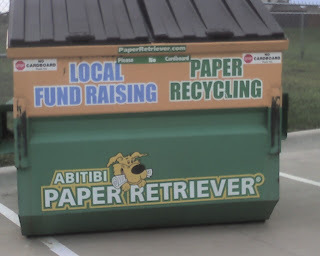 So, I was very excited to notice this recycle bin in the parking lot of the elementary school a block away from my house. I already dumped off my first batch of catalogues and magazines. I felt like such a grown up.